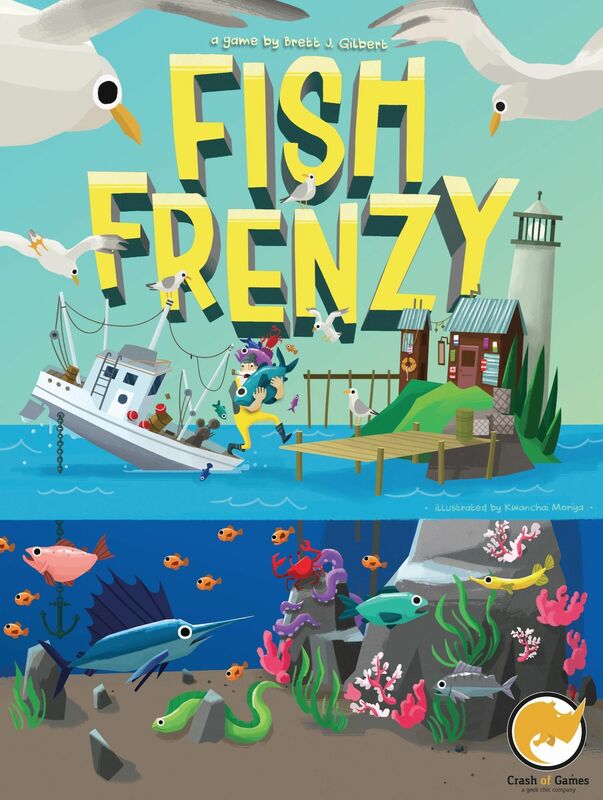 Fish Frenzy is a colorful and fun set collection game! The Captains of Rainbow Bay have hauled in their catches of colorful fish as the Seagulls of Rainbow Bay, with their bottomless bellies, hover above. The race for the fish is on! In Fish Frenzy players are competing for majorities of each of the seven fish colors. If a player has the most of a fish color they will score 3 points, if they have the second most they will score 2 points. In the event of a tie for first both players will score two points and the player in second will not score any points. Each Crab Card a player has at the end of the game is worth -1 point. Players also have the opportunity to add to their scores by using the "Goal and Event" which are an advanced variant once players have a game or two of Fish Frenzy under their belt. Goal Cards give points to the single player that achieves the listed goal at the end of the game. Event Cards present a condition that all players can potentially achieve to score points. After all points have been calculated the player with the most points wins!